While best friends Noah and Penny (and my bestie Samantha, Penny’s mother) are sad that summer is coming to a close and it’s time to say goodbye to Backyard Summer Fun, we are all excited about the approaching school year and all of the new excitement that brings. Starting school is a big exciting change for the whole family that can sometimes be met with trepidation so I wanted to make sure that Noah was as relaxed and prepared as possible to take on this new adventure. 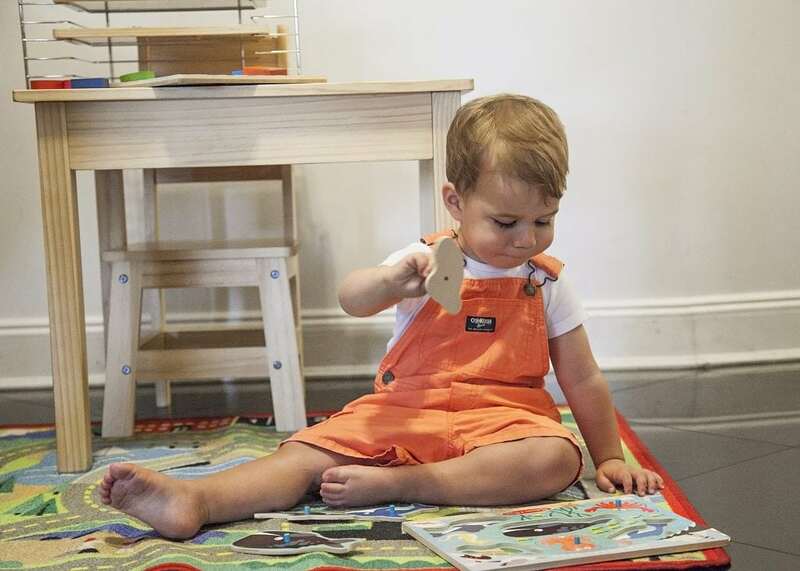 To help him get ready for school, we pulled out our favorite educational toys from Melissa & Doug and invited over his best friend Penny to start getting him prepared for the routines and exciting learning adventures that await him at school. To start getting Noah and Penny ready for back to school play, the first thing we did was set the scene. 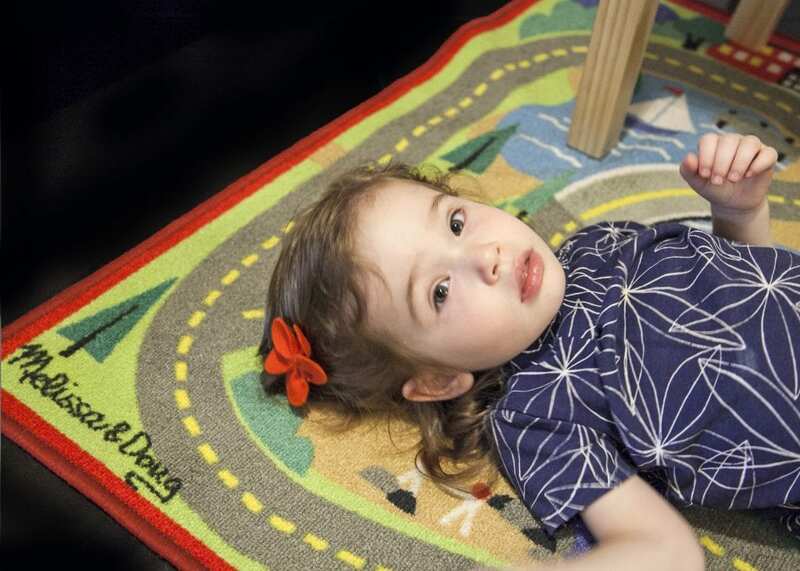 Since he received it as a gift from his grandmother last year, the Round the Town Road Rug has been Noah’s favorite place to sit and play. To get the kids in the school spirit, we added the Melissa & Doug Wooden Table and Chairs so they could practice sitting up to a table and focusing on an activity just like they will be doing at school. I love the sturdy construction of the table and chairs and I have no doubt that that these pieces will survive countless hours of play until my little guy is ready to graduate to the big kids table. Even better, the classic look of the table and chairs looks like what Noah will be using at school so having the same play setup at home will help make school feel more relatable and make the transition to going off to school as comfortable and familiar as possible. We introduced the kids to the table in the best way possible, with the Melissa & Doug Nesting &Sorting Garages & Cars and, as you can see, Noah was a big fan. I love how many different educational components are packing into this one great toy. 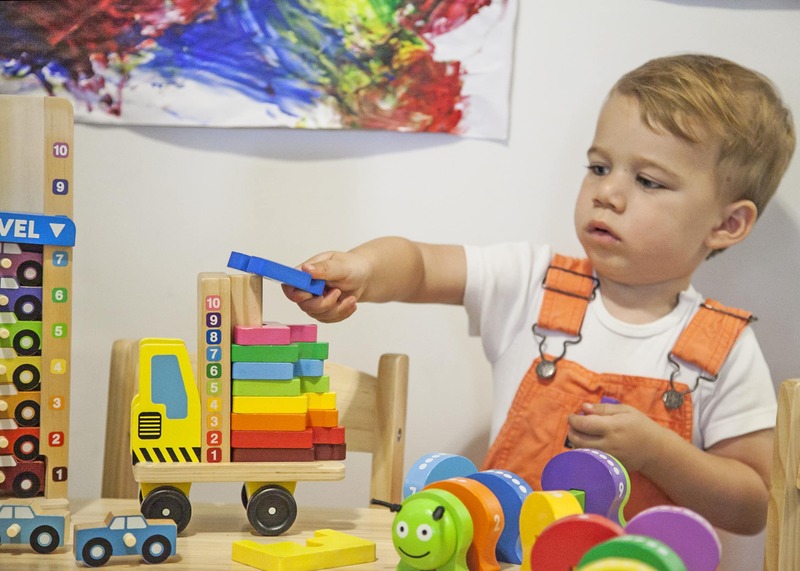 The bright colors and easy stacking draw Noah in and get him engaged with the toy while working on his motor skills and it gives us a great tool to practice recognizing and naming our colors. 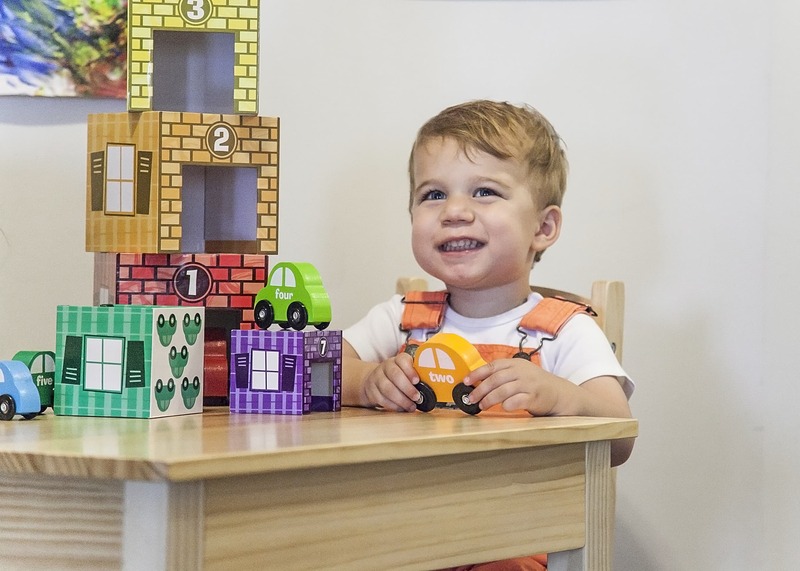 As we get deeper into our play we can start discussing number and practicing our counting with the numbered cars on the back of the blocks and matching the numbered, colored cars to their corresponding garages for more advanced educational play. I love how this toy grows with his developing skills and Noah loves that it’s so much fun to play with. Some of the most basic skills our toddlers will learn when heading off to school are colors, number, counting, stacking and sorting. Melissa & Doug makes an amazing collection of products to help practice these skills for the transition to school and reinforce those new skills while back at home. 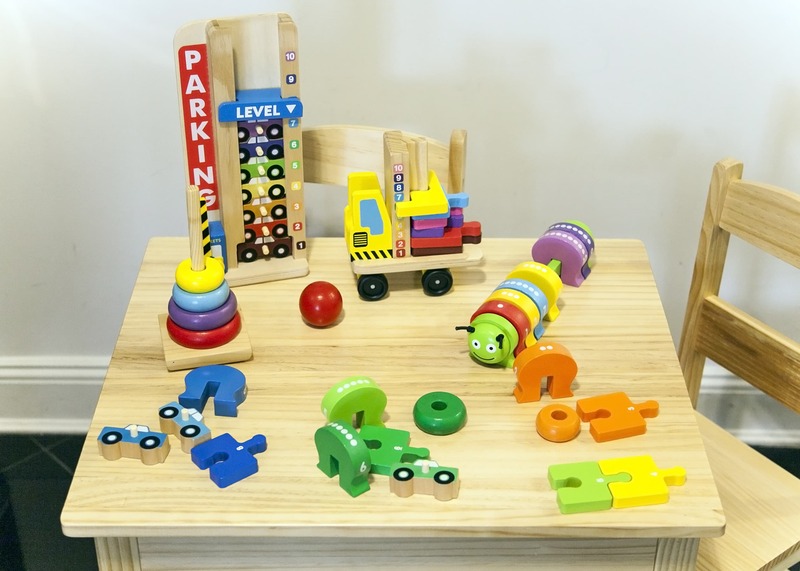 To help Noah and Penny spark their play and start working on these critical skills, we brought out the Counting Caterpillar, Stack & Count Parking Garage, Rainbow Stacker, and the Stack & Count Forklift. Putting these toys all together for play also allowed us to play “outside the box” and use them together to create new games and make the toys new again through new forms of play. For example, we challenged Noah and Penny to put all the blue pieces from the different sets into a pile, then all the red pieces, etc. The toddlers lit up with their new mission and excitedly sorted through the toys trying to track down every piece according to our instructions. As they continue to grow and learn, we could challenge them to do the same with numbers, shapes or more complex criteria to continue to make old favorite toys feel new and exciting again. Because Melissa & Doug toys all have several facets and different skills sets built into them the possibilities are endless! One of my favorite parts of Noah’s budding vocabulary is talking with him about his day and what we learned and explored. This collection of toys gives us both the vocabulary to talk about what he learned and did in school each day and gives us wonderful bonding time after a day apart. I love that these toys (many of which he will use at his school) give us a way to make school and education a fun part of our family time also to help set up a lifetime love of learning. Rug time is an important part of classroom play so when getting him ready to go off to school, I make sure that Noah has plenty of free play time and explore his imagination through free play and having the right setup helps him escape quickly into his imagination for critically important imaginative play time. 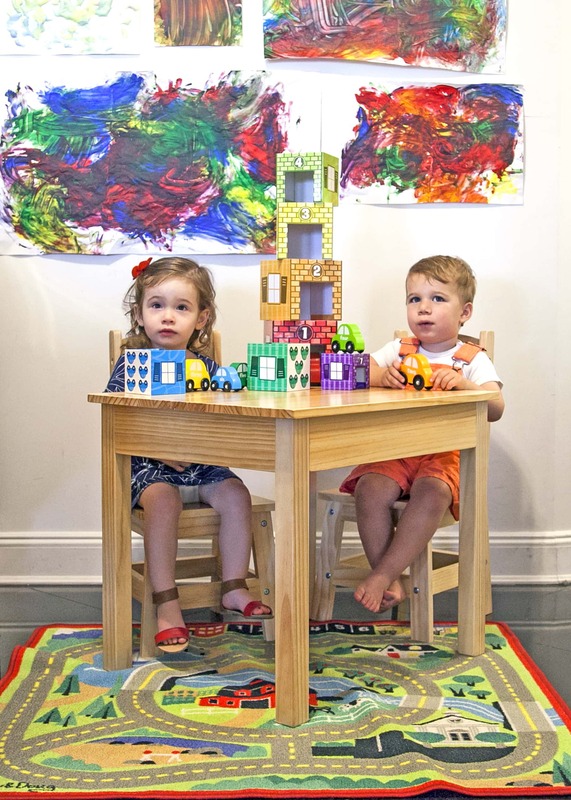 Our favorite free playtime includes the Melissa & Doug Nesting & Sorting Barns and Animals which is right at home on our Round the Town Rug. The farm scene on the rug really help Noah’s imaginative play with the barn and animals come to life and I love to watch him arrange the barns along the road on the rug or have the animals “eat” the apples off of the trees. 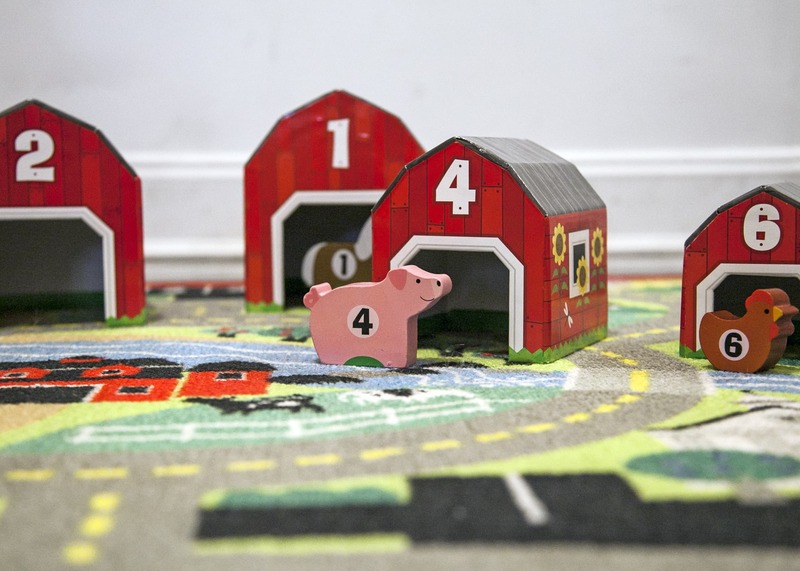 Once he’s explored the barn through free play, the numbered nesting barn is the perfect way to start working on our numbers to get ready for and reinforce the new lessons he will be learning at school. An incredibly versatile toy, we practice lining the numbered barns up in order, matching the numbered animals to their barns, stacking the barns by size, the possibilities are endless! One important way that I’m getting Noah ready to start school is by having a conversation about school and what starting school means. 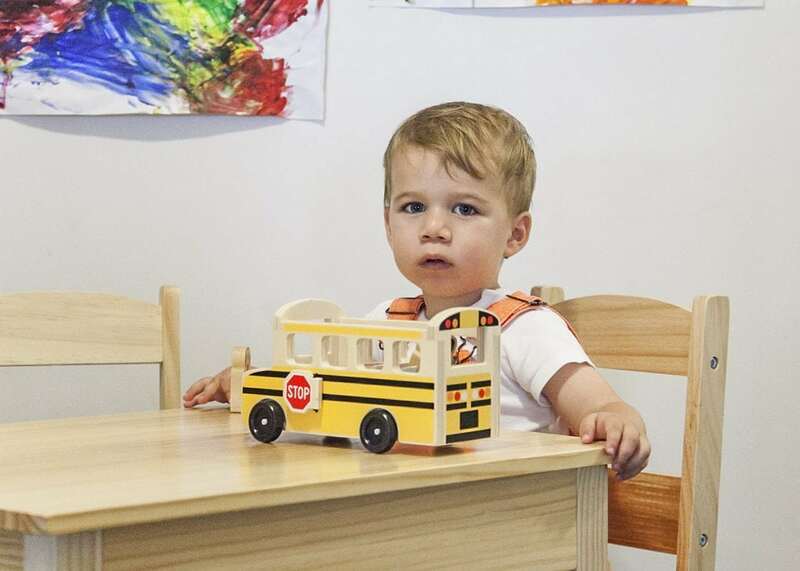 Because toddlers love to learn things hands-on, this was a great time to introduce this wooden School Bus Play Set. Noah was so excited to explore the school bus especially the bungee door and stop sign that he opened and closed a zillion times. I love that while we were having a fun conversation about starting school he was also working on his dexterity and motor skills moving the wooden bus passengers in and out of their bus seats. When he is a little older and starts riding the bus, this favorite toy will be a great way to start the conversation and make a new and potentially intimidating activity feel like an extension of his playtime adventures. One exciting part of starting school is getting into a back to school routine and the My First Daily Magnetic Calendar was the perfect tool to help my little man understand the rhythm of our new daily school schedule. Every morning after breakfast we go to our calendar and talk about the day of the week, the date, the weather, how we’re feeling that day and what we have planned for the day. 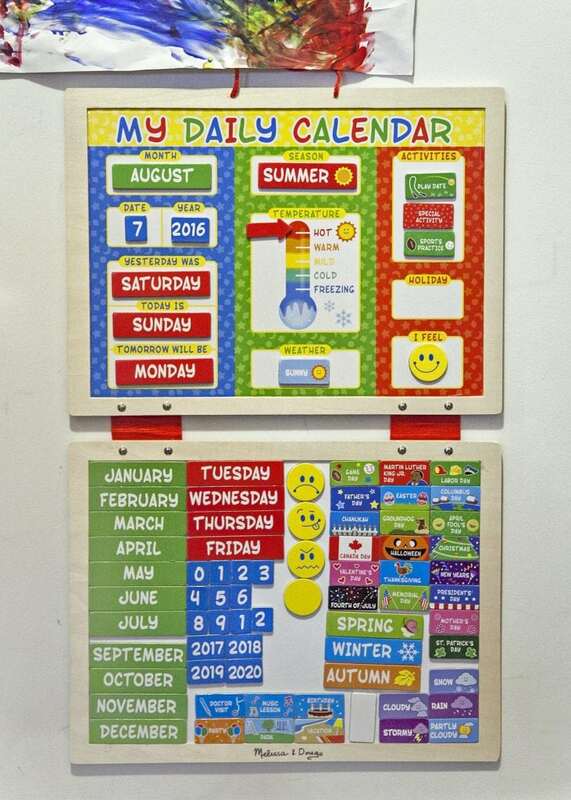 The colorful chunky magnets that store on the lower portion of the board make it easy for little hands to adjust the calendar to fit the day and make it easy for him to see at a glance what he can expect from the day ahead. This predictability in his daily routine even when we’re engaging in new activities gives him the confidence he needs to approach new activities with excitement and I think this will also make the transition to going off to school another exciting activity in his schedule instead of an unknown change in his routine. As a wonderful bonus, talking about and recording the weather for the day opens up a wonderful dialogue about how we should dress for the weather each day and makes getting an independent little boy out the door in weather-appropriate clothing a much easier task. Noah loves having some ownership in the decision of what we have to wear and why and I have high hopes that come fall as the temperatures drop it will be much easier to get him into his jackets because we’ve already discussed it on our daily calendar and he’s been a part of the decision making process. My little guy loves puzzles and I love to watch to his coordination and problem-solving skills grow as he maneuvers the pieces into their designated spots. But as fun as puzzle time is, the puzzle parts can become quite a mess, which is why the Melissa & Doug Deluxe Wire Puzzle Rack is an indispensable part of our puzzle fun. I love that the rack holds 6 large and 6 small puzzles and Noah loves that his puzzles are neatly stored where he can easily access them whenever the puzzle mood strikes him. As a bonus, the easy storage means that we can practice good clean up skills that are great for home and school. 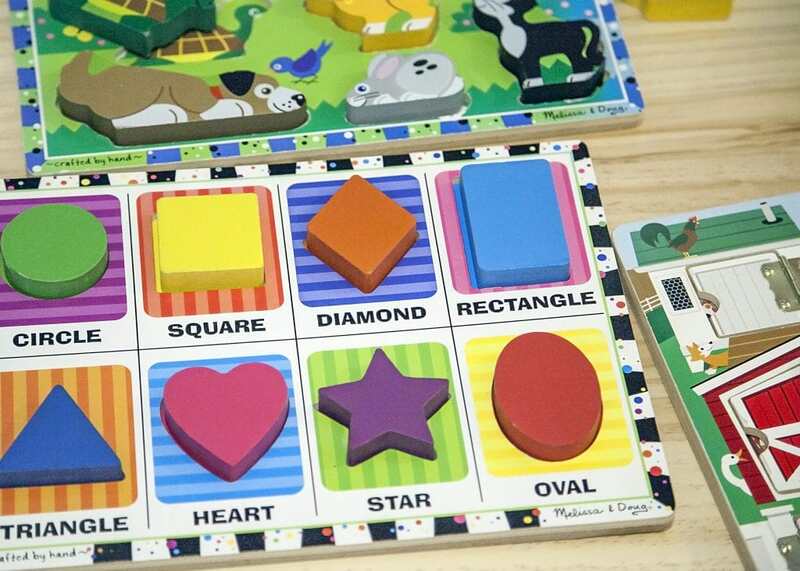 The Melissa & Doug Shapes Chunky Puzzle is our hands-down favorite puzzle in the rack and like so many Melissa & Doug toys the brightly colored chunky wooden pieces do double duty and let us work on colors and shapes to get my little guy ready for the lessons he will learn at school. Another family favorite is their Magnetic Hide & Seek Farm Puzzle, which has hinged doors that swing open to reveal removable magnetic surprises inside the barn. Their Pets Chunky Puzzle and Sea Creatures Peg Puzzle also make our list of favorite puzzles. The chunky puzzle piece size is perfect for little hands to maneuver and the different pieces find their way onto his activity rug and spark great imaginative play beyond working on the dexterity of fitting puzzle pieces into their correct spots. Heading back to school is an amazing and daunting step in my son’s development and I know that playing together and getting us both prepared for the exciting changes ahead using these strategies and tools from Melissa & Doug has made us both more excited and confident for the learning adventure ahead of us. I can’t wait to pick Noah up from school and hear all about his day at school and help him build a lifetime love of learning. My favorite part of motherhood is getting to watch my son Noah and his best friend Penny explore the world together and I love how Melissa & Doug toys never fail to spark their imagination and engage them in creative play. Because I’m such a big Melissa & Doug fan, many of these toys were already a part of our collection prior to this review. For everything else, we’d like to say a big thank you to Melissa & Doug for sending us some new favorite toys to get us ready and excited to head off to school! Written by Jessica and photographed by the fantastic Steve Sendor, father of the adorable Penny pictured above and husband to my mommy partner-in-crime Samantha Sendor. Some products proved for review. Enthusiasm for Melissa & Doug Products expressly mine.